During March everything is coloured in red and white. It's an incredible phenomenon to witness. In Bulgaria the weather in spring can be extremely varied. It can be sunny and warm in the morning but then rainy and gloomy in the afternoon. Even snow is not uncommon. By now you are probably mighty curious as to why spring in Bulgaria can be so unpredictable. While some people outside Bulgaria may check a meteorological source to discover why this is, Bulgarians have their own explanation. They blame the fluctuations in weather on a little old lady called Baba Marta, also known as Grandma March. In Bulgarian folklore Grandma March is a grumpy lady whose mood changes very quickly. It is believed she is responsible for those lovely sunny rays, but also those icy sub-zero blasts. When she is happy she showers the country with warmth and when she is angry she blankets everything in snow. Something, then, must be done to placate her. 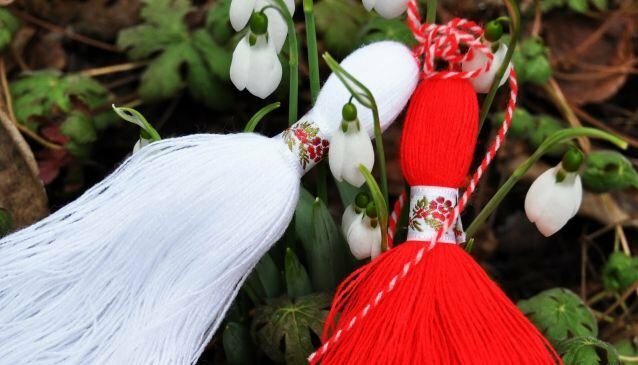 The answer for Bulgarians is on 1 March to exchange martenitsi, which are made from entwined red and white threads which are usually woollen but can be made from other materials such as silk or cotton. The white represents strength, purity and happiness, while the red is associated with health, fertility, blood and conception. Wearing this symbol is a centuries-old tradition and gives Bulgarians hope that Grandma March will bring a joyful and sunny spring. 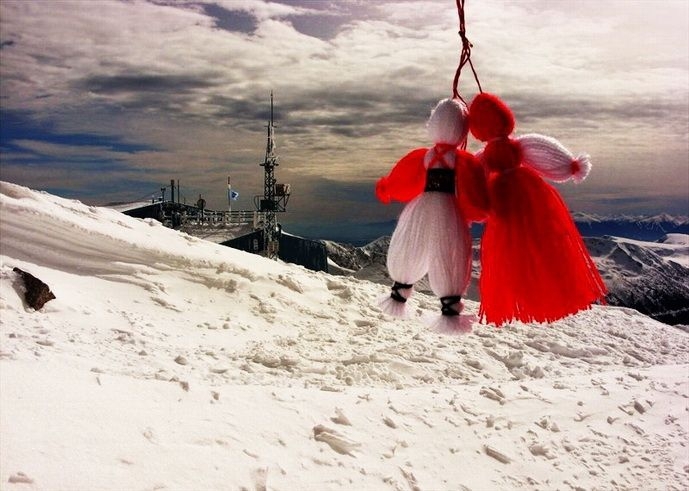 A typical type of martenitsa is one which is made up of two small woollen dolls called Pizho and Penda. Pizho, the male, is usually white so that it symbolises the strength of the man, while Penda, the female, is almost always red as she symbolises fertility and health. The martenitsi can, however, come in many other forms, such as bracelets, necklaces, pompons or even animal figures. During March everything is coloured in red and white. It’s an incredible phenomenon to witness. You will see a handful of stalls everywhere in every city as people usually produce the martenitsi themselves and are proud to share their wares with all passersby. 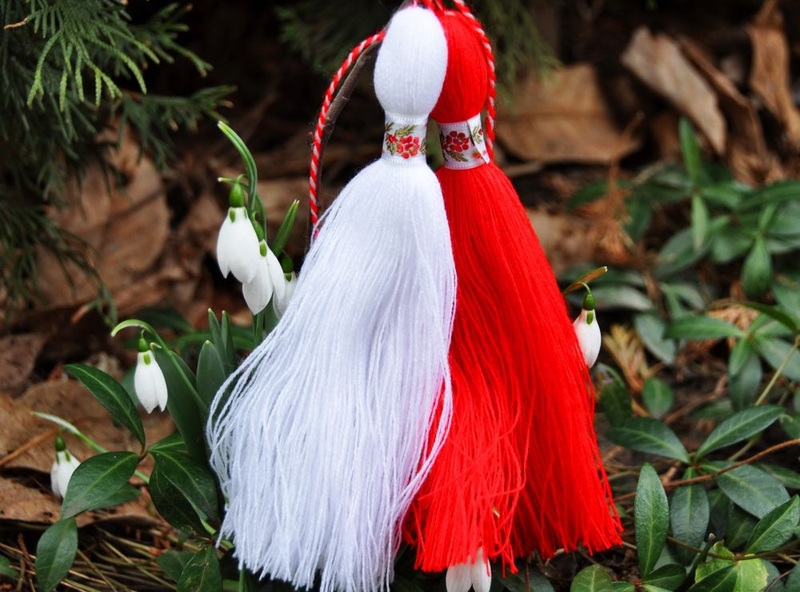 If someone gives you a martenitsa this means that he or she wishes you well, so do not hesitate to pin it on your clothes or wear it as an accessory. One of the more interesting rules with this tradition is that if you happen to see a stork, you will have to tie your martenitsa on a nearby tree. This is how the martenitsa works its magic, giving life and fertility to your chosen tree. 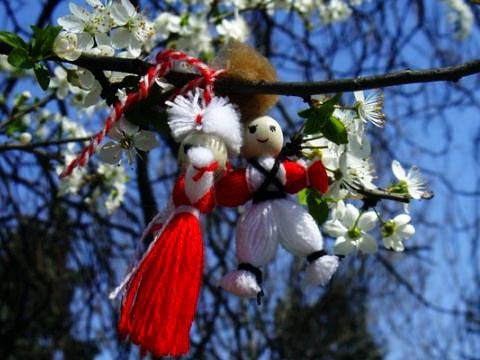 If you do not see a stork over the period, feel free to tie your martenitsa on a tree at the end of March when Grandma March is usually in a better mood, allowing the trees to blossom. This is why 1 March is such a symbolic day for Bulgarians to celebrate their heritage and tradition. And after all, we wouldn’t want to upset Grandma March, would we?